This post is being written in Missouri, and while the old saying about “I’m from Missouri, you’re going to have to show me,” has a different origin than most folk recognize*, it is a saying that has served well over the years. We did some work once for the Navy, who were concerned that shooting high-pressure waterjets at pieces of explosive might set them off, as we worked to remove the explosive from the casing. We ran tests under a wide range of conditions, and said, in effect, “see it didn’t go off – it’s bound to be safe!” “No,” they replied, “ we need to know what pressure causes it go off at, and then we can calculate the safety factor.” And so we built different devices that fired waterjets at pressure of up to 10 million psi, and at that pressure (and usually a fair bit below it) all the different explosives reacted. And it turned out that one of the pressures that had been tested earlier was not that far below the sensitivity pressure of one of the explosives. That is, perhaps a little clumsily, a lead in to explain why just getting simple answers, such as “yes I can clean this,” or “yes I can cut that” doesn’t often give the best answer. One can throw a piece of steel, for example, on a cutting table, and cut out a desired shape at a variety of pressures, abrasive feed rates (AFR) and cutting speeds. If the first attempt worked then this might well be the set of cutting conditions that become part of the lore of the shop. After a while it becomes “but we’ve always done it that way,” and the fact that it could be done a lot faster, with a cleaner cut, less abrasive use and at a lower cost is something that rarely gets revisited. So how does one go about a simple set of tests to find those answers? For many years we worked on cutting steel. Our tests were therefore designed around cutting steel samples, because that gave us the most relevant information, but if your business mainly cuts aluminum, or titanium or some other material then the test design can be modified for that reason. The test that we use is called a “triangle” test because that is what we use. And because we did a lot of them we bought several strips of 0.25-inch thick, 4-inch wide, ASTM A108 steel so that we would have a consistent target. (Both quarter and three-eighths thick pieces have been used, depending on what was available). The dimensions aren’t that important, though the basic shape that we then cut the strips into has some advantage, as I’ll explain. (It later turned out that we could have used samples only 3-inches wide, but customs die hard, and with higher pressures the original size continues to work). The choice to make the sample 6-inches long is also somewhat arbitrary. We preferred to make a cutting run of about 3 minutes, so that the system was relatively stable, and we had a good distance over which to make measurements, but if you have some scrap pieces that can give several triangular samples of roughly the same shape, then use those. The sample is then placed in a holder, clamped to a strut in the cutting table, and set so that the 6-inch length is uppermost, and the triangle is pointing downwards. Figure 2. The holder for the sample triangle. The nozzle is placed so that it will cut, from the sharp end of the triangle, along the center of the 0.25-inch thickness towards the 4-inch end of the piece. 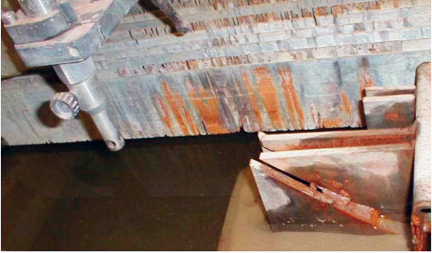 The piece is set with the top of the sample at the level of the water in the cutting table. The piece is then cut – at the pressure, AFR, and at a speed of 1.25 inches per minute, with the cut stopped before it reaches the far end of the piece, though the test should run for at least a minute after the jet has stopped cutting all the way through the sample. The piece is then removed from the cutting table, and, for a simple comparison the point at which the jet stopped cutting all the way through the triangle is noted. An abrasive jet cuts into material in a couple of different ways - the initial smooth section where the primary contact occurs between the jet and the piece, and the rougher lower section where the particles have hit and bounced once on the target, and now widen and roughen the cut. Since some work requires the quality of the first depth, we take the steel samples, and mill one side of the sample, along the lower edge of the cut until the mill reaches the depth of the cut, and then we cut off that flap of material, so that the cut can be exposed. Note that the depth is measured to the top of the section where the depth varies. Figure 4. Typical example of a steel triangle that has been cut and then sectioned to show the quality of the cut. I mentioned, in an earlier article, that we had compared different designs from competing manufacturers. 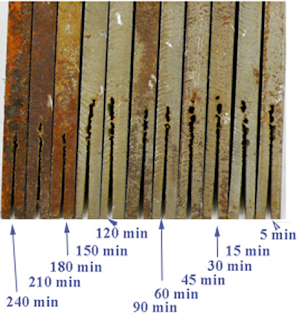 Under exactly the same pressure, water flow and abrasive feed rates, the difference between the cutting results differed more greatly than had been expected. Figure 5. 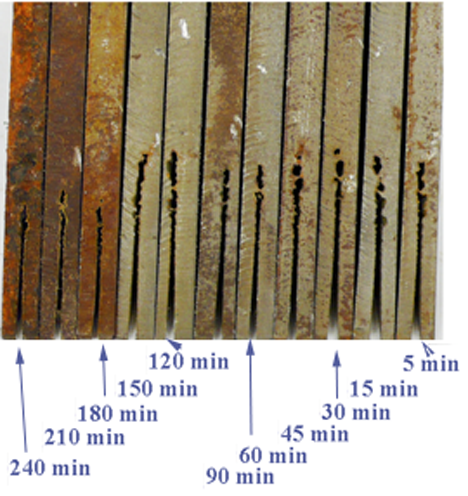 Sectioned views of six samples cut by different nozzle designs, but at the same pressure, water flow, AFR and cutting speed. There was sufficient difference that we went and bought second, and third copies of different nozzles and tested them to make sure that the results were valid, and they were confirmed with those additional tests. Over the years as other manufacturers produced new designs, these were tested and added into the table – this was the result after the initial number had doubled. (The blue are results from the first nozzle series tests shown above). Figure 6. Comparative depths of cut using the same pressure and AFR but twelve different commercially available nozzle designs. There were a number of reasons for the different results, and I will explain some of those reasons as this series continues, but I will close with a simple example from one of the early comparisons that we made. We ran what is known as a factorial test. In other words the pressure was set at one of three levels, and the AFR was set at one of three levels. If each test ran at one of the combination of pressures and AFR values, and each combination was run once then the nine results can be shown in a table. Figure 7. 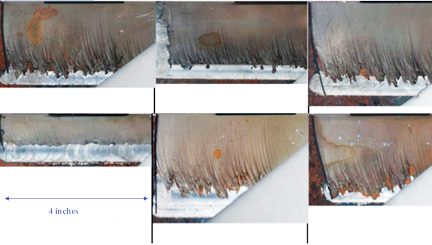 Depths of cut resulting from cutting at jet pressures of 30,000 to 50,000 psi and AFR of 0.6, 1.0 and 1.5 lb/min. 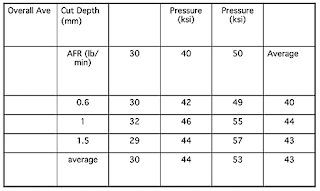 The results show that there is no benefit from increasing the AFR above 1 lb/minute (and later testing showed that the best AFR for that particular combination of abrasive type, and water orifice and nozzle diameters was 0.8 lb/minute). Now most of my cutting audience will already know that value, and may well be using it, but remember that these tests were carried out over fifteen years ago, and at that time the ability to save 20% or more of the abrasive cost with no loss in cutting ability was a significant result. Bear also in mind, that it only took 9 tests (cutting time of around 30 minutes) to find that out. * The reason that the “I’m from Missouri, you’ll have to show me,” story got started was that a number of miners migrated to Colorado from Missouri. When they reached the Rockies they found that, though the ways of mining were the same, the words that were used were different. (Each mining district has its own slang). Thus they asked to be shown what the Colorado miners meant, before they could understand what the words related to. After writing about Waterjet Technology for a couple of years at this site I have created an index, hopefully this will be updated monthly and can be found at: Waterjet Index . About ten years ago I began to write a blog, and after a time that transformed into co-founding The Oil Drum. Move on a few years, and at the end of 2008 I turned from being an editor there to this blog, although the OGPSS series continued to be posted, on Sundays, at TOD as their weekly Tech Talk. Some of the industrial technical descriptions of oilwell formation and coal mining are relatively timeless and useful, and so are listed below. Along the way I became similarly cynical about some of the facts being bruited about Climate Change, and did a little study, which is documented here as the State Temperature Analysis Series. It showed that the UHI is real and that there is a log:normal relationship between population and temperature (which is also related to altitude and latitude). You can read the individual state studies, which are listed below. There will still be the occasional post on this topic. Just this last year I was asked to write a weekly blog on the application of High-Pressure waterjetting – which is the subject that I specialized in for four decades. That too is now, therefore, a part of the contribution. And, in my retirement, I have become curious about Native Americans and what they looked like. And so I am now learning Poser and related programs, and may inject both posts and the odd illustration – helped by the many real artists who work in that medium, as I read and try and comprehend what went on in the depths of The Little Ice Age (around 1600 – 1700). Because I am a Celt, there will also be the odd post on my lineage and some of the DNA studies that relate to history. So, if you can stand the confusion, welcome to the site. One of the problems in following stories in different countries is that they use different units and symbols. This can be a bit confusing, and so, where I can, I will try and standardize on the unit of barrel/day, or bd for oil. I will also use a thousand cubic ft kcf for natural gas. Prices will also be standardized, when I can, in $/kcf for natural gas, $/barrel for oil, and $/gallon for gasoline. In larger units volumes a thousand barrels a day becomes 1 kbd and a million barrels a day becomes 1 mbd. For natural gas a million cu ft per day will be 1 mcf. (In many quotes this has appeared as 1 MMcf). A billion cu. ft. is 1,000 mcf. Note that a cubic foot of gas produces 1,030 Btus - so to simplify 1 million Btu's is approximately 1 kcf, or 28.3 cu.m. of natural gas equivalent. A ton of oil is 7.33 barrels. (Mainly used in Eastern Europe). Since not all posts before this show these units - note that this change happened on March 3, 2009. Information on me and the site. CC - Watts Up With That?